The trip from Anguilla to Cancún, Mexico should have only been 2,500km by air. The longer (and cheaper way, saving $400CAD) via New York took 5,200km and 16 hours. The pain was well worth it as I will now be reunited with my friends Sybil and Vivien from Toronto for the next three weeks! Yippee! 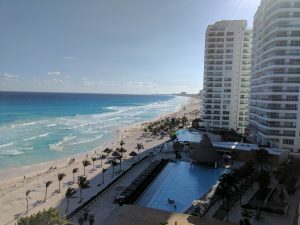 The view from our hotel in Cancún. Syb did an amazing job organizing the itinerary for this portion of my travels. Jamming it full of activities and sightseeing in over three countries! 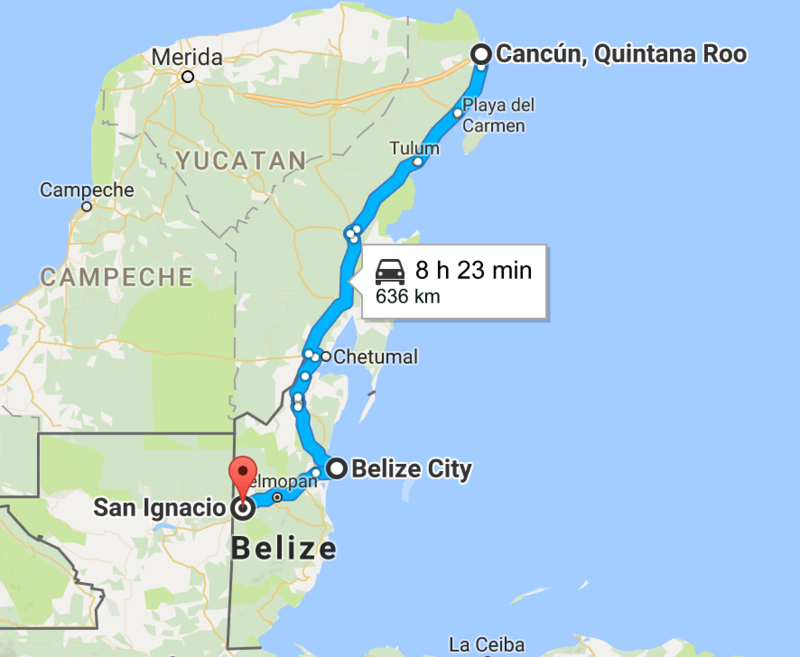 Our first challenge: Taking the 12 hour overnight bus from Cancún, Mexico to Belize City, Belize. Then hopping on another bus to San Ignacio, Belize, where we will be stationed for the next three days. 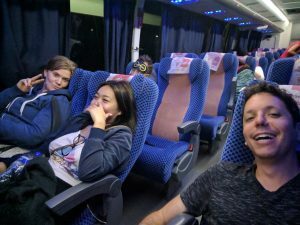 I’ve never done a marathon bus ride like this before, especially one involving a border crossing. We bought our bus tickets from the Cancún Airport for $888MXN. The ADO bus departed for Belize City at 10:15pm from the city central bus station giving us about eight hours to kill. We had booked a room at a hotel in Cancún to be able to take advantage of its amenities. We spent the next 6 hours or so swimming in the ocean, eating, and napping before our bus ride into Belize. My first impressions about the bus were way better than I expected. Seats were comfortable and they reclined to an almost lie-flat position! Our driver was playing his own Mexican inspired music on the radio. We were close enough to the front of the bus to hear the music all night. I wouldn’t be surprised if this is what kept him going all night while driving south towards the border town of Chetumal. The ladies had brought hoodies and blankets for the ride down. A prudent preparation as the A/C was on full blast the entire time (another tactic to keep the driver awake!?). In an effort to control speeding in Mexico and Belize, the authorities have installed massive speed bumps and speed tables at every village. These bumps force the bus to come to a crawl to negotiate them, thus adding precious minutes to your travel time. 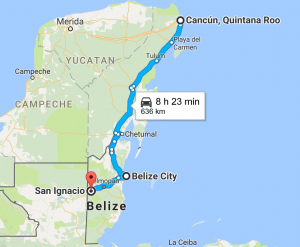 This, combined with the many stops to deal with passengers embarking and disembarking, the 380km trip from Cancún to Chetumal took 6.5 hours. 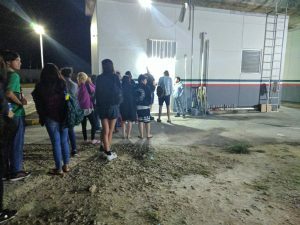 Having arrived at the only land entry into Belize from Mexico, we line up, passports in hand, to go through immigration. Lining up outside to pay our Mexico departure tax. We pile back in the bus for the 5 min ride to the Belize passport authorities to do the same song and dance all over again. Arriving in Belize City, we got off the bus and hopped on to the Chicken Bus to San Ignacio ($10BZD). This retired North American school bus was packed full of Belizeans (and us) heading west. Time was on our side, as crossing the Belizean border you turn the clocks back an hour to Central time (read why). So taking the regular, non-express route to San Ignacio was fine by us. (Pro Tip: there are express chicken busses that you can take). Weary-eyed and tired of travelling, we check into Martha’s Guesthouse and begin our adventure in Belize.